It is so tantalizingly close to autumn that I could swear my light jackets are inching their way off their hangers, my boots seem to be not-so-subtly poking their toes out of my closet and my windows are practically flying off their runners in their eagerness to be opened. I love this (soon-to-be) season. Autumn means finally being able to spend time outside without a) turning into a human-lobster hybrid; b) sweating to the point of being a biohazard; and c) becoming dinner for myriad bloodthirsty bugs - all good news for those of us who like to steal a few minutes to read outside. If you're one of the aforementioned, you might also appreciate a nifty little creation by Mathieu Gabiot. It's called Le Bouc. 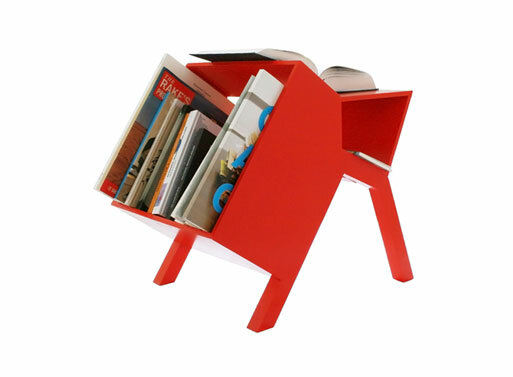 Red, mobile and handy, Bouc is your ideal companion for reading. Bouc, a small, varnished piece of furniture dedicated to books, can either be an extension to your library, an occasional table for reading or placing books, or a desk for your book of the moment. Bouc loves books. It supports them, open or closed, keeps them available at all times, whether you are in your office, drawing room or garden. It measures just over 15 inches in length by 19.5 inches in height. The frame is made from varnished MDF, the underframe from varnished beech. You can choose from a red, white or black Bouc - red will cost you €195, while selecting black or white will run your bill to €245. Read more about it here.